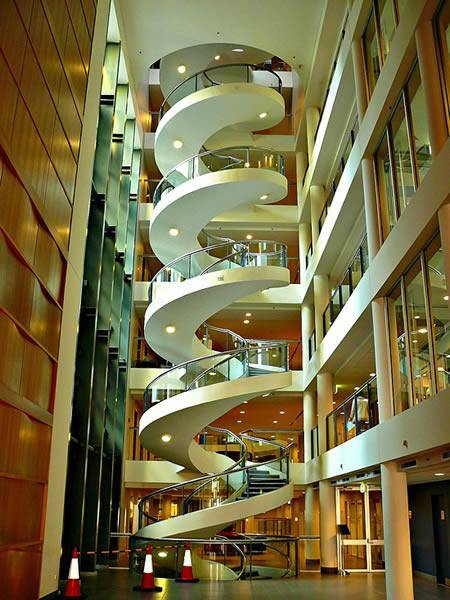 Fascinating spiral stairs at Garvan Institute in Sydney, Australia. 6.5 revs and five stories from top to bottom. 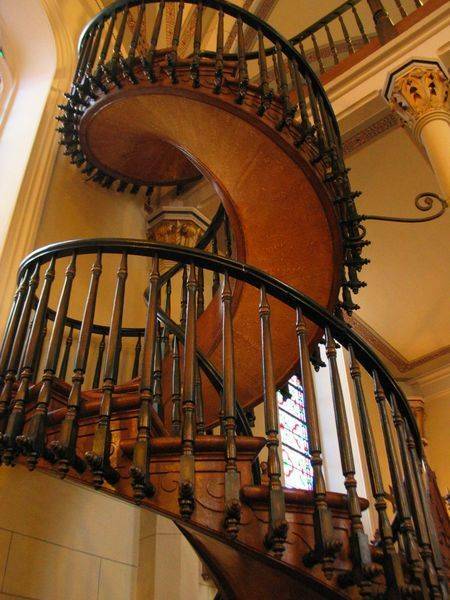 The Loretto Chapel is a chapel in Santa Fe, New Mexico, known for its unusual spiral staircase that is an exceptional work of carpentry. 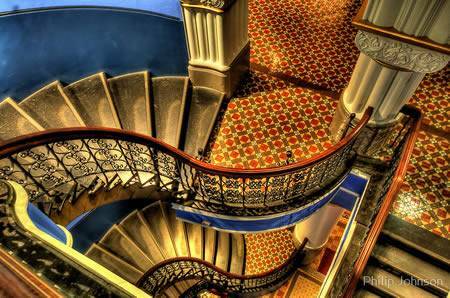 The construction and builder of the staircase are considered a miracle by the Sisters of Loretto and many who visit it, because it had no central support (a support was added later). 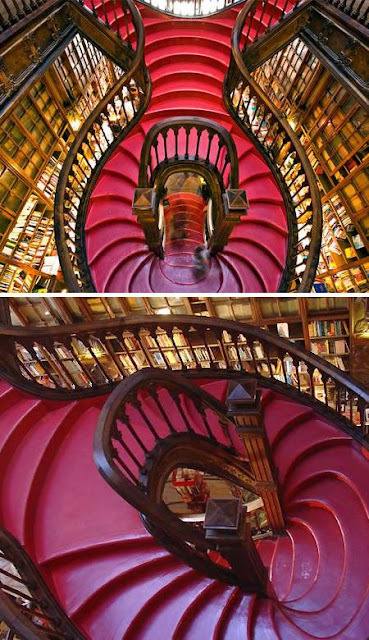 The resulting staircase is an impressive work of carpentry. It ascends twenty feet, making two complete revolutions up to the choir loft without the use of nails or apparent center support. 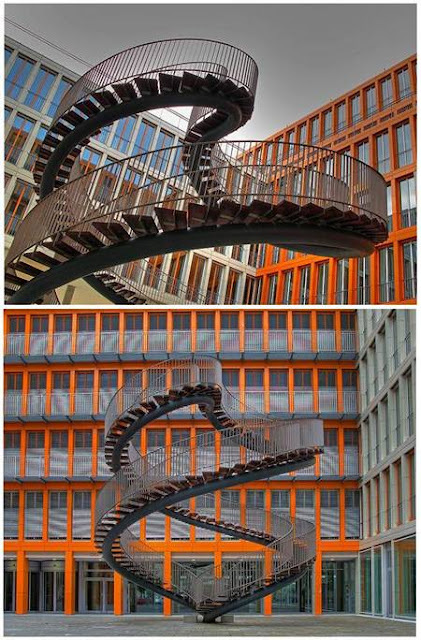 It has been surmised that the central spiral of the staircase is narrow enough to serve as a central beam. Nonetheless there was no attachment unto any wall or pole in the original stairway. 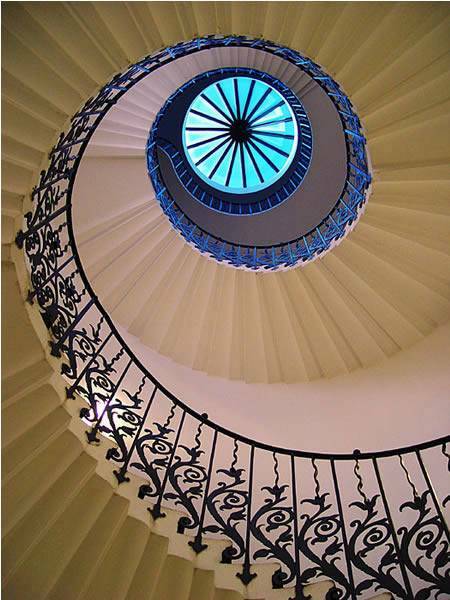 Instead of metal nails,the staircase was constructed using dowels or wooden pegs. 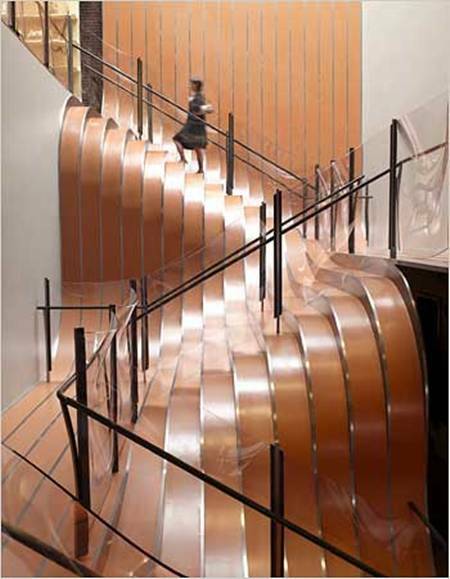 The wood for the staircase cannot be found anywhere in the region. The stairs had 33 steps, the age of Jesus when he died. The mystery had never been satisfactorily solved as to who the carpenter was or where he got his lumber, since there were no reports of anyone seeing lumber delivered or even seeing the man come and go whilethe construction was being done. Since he left before the Mother Superior could pay him, the Sisters of Loretto offered a reward for the identity of the man, but it was never claimed. The bridge over the Traversinertobel, a side valley of the Via Mala, is the latest structure of this kind designed by engineer Jürg Conzett and his associate Rolf Bachofner . They solved the problem of connecting two different elevations over the gorge by creating a staircase.The staircase replaces a rope bridge for hikers that was wiped out by a rock slide. 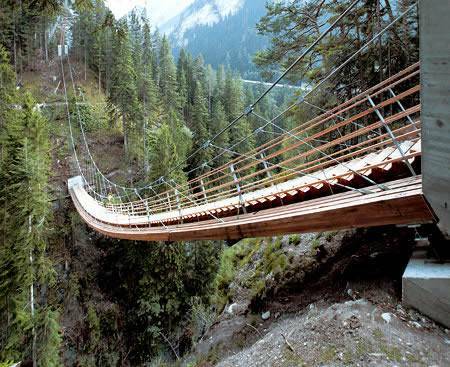 This suspended footbridge spans a distance of 56 metres, with a difference in height of 22 metres between the two ends. New Species Found in Remote Asian Sea?